Ian McKellen (Sir Ian Murray McKellen) is an English actor that was born on May 25, 1939 in Burnley, Lancashire, England, UK. 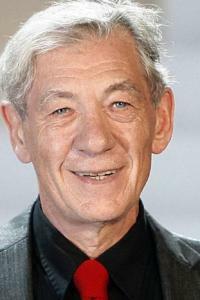 He is 5' 11" (1.8 m) and was born to mother Margery Lois and civil engineer father Denis Murray McKellen. His sister Jean is five years older than him. His family moved to Wigan, Lancashire before the Second World War in September 1939 started. They then moved in 1951 to Bolton because his father got promoted. His mother died when he was 12 years old and his father died when he was 24 years old. His then lived with his stepmother Gladys McKellen who is a member of the Religious Society of Friends. He told his stepmother of his sexuality and he said "Not only was she not fazed, but as a member of a society which declared its indifference to people's sexuality years back, I think she was just glad for my sake that I wasn't lying anymore." Ian is from a non-orthodox Christian home and is from Scots-Irish, English and Scottish descent. He referred to his childhood as "My upbringing was of low nonconformist Christians who felt that you led the Christian life in part by behaving in a Christian manner to everybody you met." Ian attended Bolton School (Boys' Division) and is a supporter of the school which he attends regularly to talk to the kids. He started his acting career at Bolton Little Theatre. His sister Jean took him to his first Shakespeare play, Twelfth Night, at the Wigan's Little Theatre. He won a scholarship to St Catharine's College, Cambridge when he was 18 years old. He began acting to help him escape and deal with the bullying at school and the death of his mother. He works in many genres including Shakespearean, modern theatre, fantasy and science fiction. He is famous for his role as Gandalf in The Lord of the Rings and The Hobbit trilogies. He is also famous for playing Magneto in the X-Men films. - Recipient of six Laurence Olivier Awards, two Saturn Awards, a Golden Globe Award, two Critics' Choice Awards, a Screen Actors Guild Award, a BIF Award, four Drama Desk Awards and a Tony Award. - Received two Academy Award nominations, five Emmy Award nominations and four BAFTA nominations. - Has a tattoo of the Elvish character number nine on his shoulder that is written in Tengwar. 1964 - Had his first serious relationship with partner Brian Taylor who was a history teacher from Bolton. 1978 - Met his second partner, Sean Mathias, at the Edinburgh Festival. 1981 - Won Broadway's Tony Award as Best Actor for the role of Antonio Salieri in "Amadeus"
1984 - Awarded the London Evening Standard Theatre Award for Best Actor for his performance in "Coriolanus"
1985 - Awarded the Laurence Olivier Theatre Award for Best Actor in a Revival for "Wild Honey". 1988 - He publicly came out of the closet on the BBC Radio 4 program. 1989 - awarded the London Evening Standard Theatre Award for Best Actor for his performance in "Othello"
1991 - Awarded the Laurence Olivier Theatre Award for Best Actor in "Richard III"
2003 - He made a guest appearance as himself on The Simpsons cartoon show in a British-themed episode entitled "The Regina Monologues". 2008 - Ranked #45 in the 2008 Telegraph's list "the 100 most powerful people in British culture". 2012 - He stated on his blog "there is no cause for alarm. I am examined regularly and the cancer is contained. I've not needed any treatment." 2013 - Became an ordained minister of the Universal Life Church because he wanted to preside over the marriage of his X-Men co-star Patrick Stewart to his then fiancée Sunny Ozell. 2013, November - He appeared in the one-off Doctor Who 50th anniversary comedy homage The Five(ish) Doctors Reboot.